This is a simple procedure. All you need is a phillips head screwdriver and a lil patience. If you got the 360 open, this is a cinch! This procedure is necessary for your New DVD Drive to recognize 360 games! 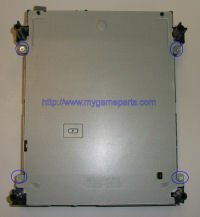 You must flip the drive over and remove the 4 screws on the bottom, circled in blue in the image to the left. When you're done, simply pull the bottom of the drive to slide it off. 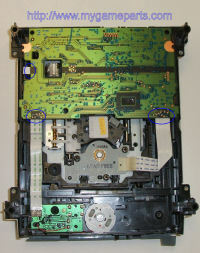 Second, push on the tab squared in blue to release the circuit board from the housing of the DVD Drive. Third, there are four cables leading from the drive to the circuit board. One for the worm motor, one for the laser, one for the spindle hub, and one for the tray gear. Remove the cable leading from the worm motor to the circuit board by pulling it out. You can then flip the circuit board over as seen in the next step. With the circuit board flipped over, it's easy to remove the rest of the cables. Voila! 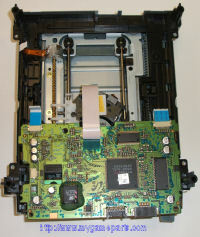 The circuit board is removed. I like to put the laser cable back in first. It's angled weird and has a bunch of tiny pins. I like to put it in first to avoid damage to it. At this angle, it's easiest to install the laser cable. Re-Install everything else by reversing the directions above! 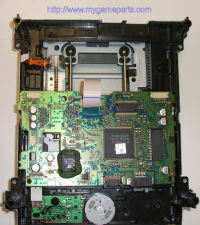 After you are done, your new XBOX 360 drive will contain the circuit board from your old drive which contains the key necessary for the drive to read XBOX 360 GAMES. ENJOY and HAPPY GAMING!!!! !